Have you ever read something and felt like the author was speaking directly to you?? If there was one thing I could change about myself would it be my confidence? Is that even possible?! Let me tell you about the “Confidence Creator”. The title gets me right away. I never considered confidence to be something you could create. (Isn’t that ridiculous?!) I have always considered myself a bit of an introverted-people- pleaser. I like people, and I like making them happy, but I am not a confident extrovert. I don’t like being the center of attention. Heather really spoke to me and how I need to make myself happy and confident FIRST and then others will see that and follow suit. Heather Monahan really gives it to you straight. She speaks from the heart and walks you through her life showing you exactly when and how she learned how to be confident. She gives great insight on how she would do-over her real life situations now looking through her confident lens. She shows you how you can change and grow your confidence right here and now. She is so open, honest and vulnerable that you’ll just fall in love with her and relate to her struggles. 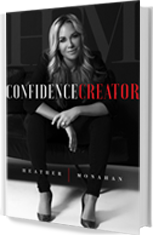 She breaks confidence down into it’s simplest forms and teaches you how to achieve it starting today. One section that REALLY spoke to me was her “One-week challenge”. She speaks about how we are putting ourselves down every time we apologize without purpose and how to change that. I am such an offender of this. I once apologized to my cousin because he tripped on the sidewalk. It just came out! “Oh, I am sorry you tripped.” Ummmm, WHAT?! WHY would I blurt that out?! I cannot believe all the things I have been apologizing for. I am officially replacing my unnecessary apologies for an intentional phrase that “puts me back in the driver’s seat.” Heather teaches you simple ways to apply these methods to your every day life so you can start feeling more confident today! I claimed 2018 to be MY year. I have focused my efforts on improving my skills and becoming 1000% confident behind my camera, manipulating light and putting families at ease in front of me. I am confident there, but it is elsewhere in my life and in growing my business where my confidence lacks. Here we are in April, and I could not have found a better time in my life to read this book. It may just be time for me to book a one-on-one, Heather! I would imagine this book is going to sell out fast when it hits on May 22nd so I suggest pre-ordering it today!! You will be immediately equipped with the tools you need to start feeling more confident each and every day. What you put out into the world is what you will receive so start receiving today! !